I guess every lady has such moments in her life when she needs to chill out and feel comfortable wearing her clothing. Today I am happy to share with you my favorite ways of wearing a slouchy sweater this year. I think every lady loves sweaters. This is a basic top that can be styled with almost anything. If you think this knitwear is appropriate only for casual days, then you are totally wrong my dear reader. I am going to show you awesome styles that can be worn from the office to dates and special parties. Hope you like these combos the same as I do. You can wear it as a dress. If your sweater is long enough, then there is a chance to use it as your favorite frock. This is the most easiest way of making it look chic, elegant and sweet. All you need is the spacious bag and pretty boots. You can either choose ankle-boots for warm days, or keep your legs in warm by choosing knee-high or thigh-high styles. If it’s still cold, then my advice is to add a pair of tights or leggings underneath your sweater. As you all know, everything looks perfect if it’s balanced the right way. You can match your slouchy sweater with tight bottoms. This is a great way to add a contrasting effect to your everyday outfit. 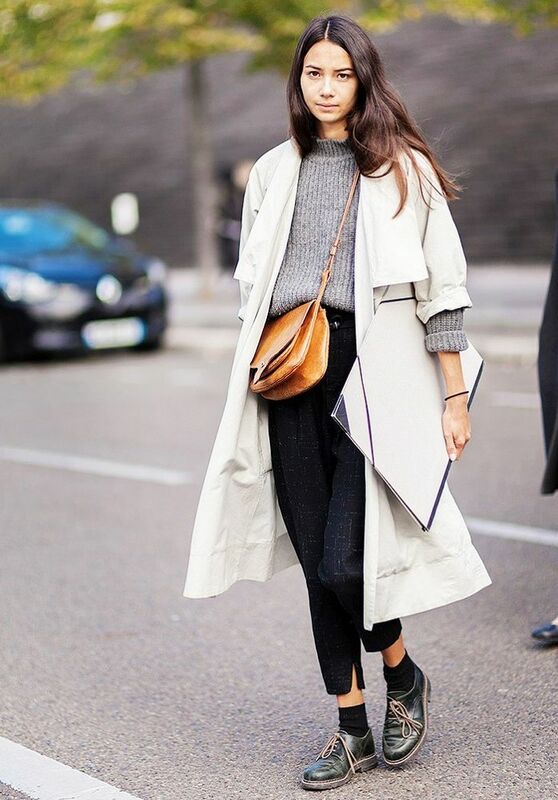 If you want to make your bulky look more polished, then the best way is to add a trench coat. This additional layer will surely give you a contrasting look. How about teaming your pretty knitwear with flowing skirt? You don’t have to pair your slouchy knitted top with something polished and tailored, as you can simply add a feminine flowing skirt. All you need is to tuck the knitwear inside the skirt. How about wearing your favorite top for the office? Be sure to pair slouchy sweater with work-appropriate clothes. Complete the look with classic accessories, or keep them minimal. There is a perfect chance to style your favorite sweater with mini skirt, creating that special sporty look. Mini skirt should be barely seen out of the sweater. The last but not least is the monochromatic look that can be achieved thanks to your marvelous sweater. However, you better keep away from bulky knitwear styles. Here we see a fabulous black wool coat with fur collar draped over light gray high-neck oversized sweater teamed with white skinnies and glossy black leather loafers. Check out other essential outerwear ideas for Winter, as I have cool outfit ideas for you to get inspired by! Be sure to see all my favorites right now. In love with this combo, a pastel blue turtleneck pullover is worn with a black pleated mini skirt and suede black knee-length boots. The tortoise oversized sunglasses make this lady look sophisticated. By the way, if you want to know more ideas how to wear black clothes with other colors this Winter, then you should check my blog post, where I describe all possible ideas and street style pics that can be tried this year. Do You have any thoughts about Slouchy Sweaters For Women? Here are Fashion Tips pictures and trendy women’s outfits which are in style in 2019: Best Sweaters For Women, How To Wear Slouchy Sweaters, Knitwear Fashion And Outfit Ideas For Inspiration, Layered Outfits, Must Have Fashion Trends For Women, Office Style, Oversized Sweaters, Preppy Style, Slouchy Sweaters, Street Style Women's Fashion And Inspiration, Sweater Dresses and tips on how to wear them on the streets.